The Budapest Ferenc Liszt International Airport is Hungary’s major international gateway and busiest airport. It sits outside of the country’s famed capital city of Budapest. Though Hungary isn’t that expensive compared to the rest of Europe, even budget travelers ought to save at least $50 per day per person. Tourism in Hungary peaks during the summer, when temperatures are around 21 to 27˚C (70-80˚F). Winters in Hungary can get quite cold, typically hovering around -4˚C (25˚F). Handmade products, in particular dolls, are commonly purchased souvenirs from Hungary. For many travelers, Hungary is the ultimate Central European destination. Not only does the country possess a strikingly beautiful landscape and lively cities, it also has a fascinating history with a true blend of Eastern and Western traditions. What’s more, most travelers find Hungary to be slightly less expensive than many European alternatives. 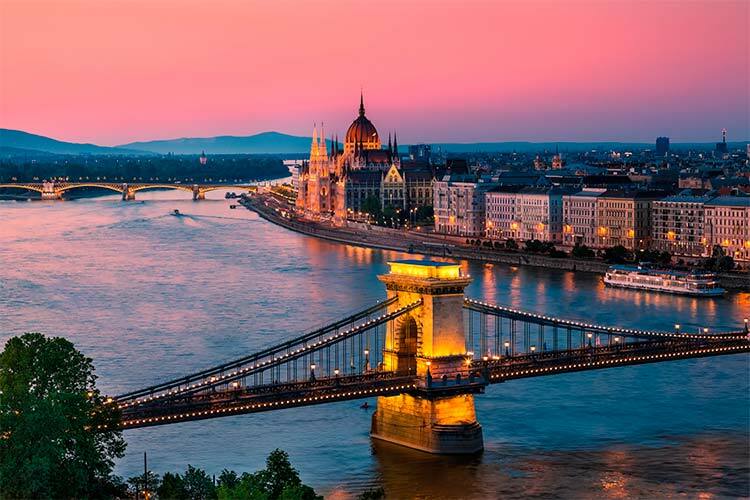 For these reasons and more, it’s hardly surprising that Hungary has been the thirteenth most popular destination among travelers for nearly fifteen years. To really get the most out of a Hungarian travel experience, one needs to understand a bit about the history of Hungary. Like much of Europe, Hungary was originally inhabited by a number of disorganized hunter-gatherer groups. It wouldn’t be until the heyday of the Roman Empire that Hungary truly began to grow in prominence. After the fall of the Romans, Hungary was ruled by a variety of foreign invaders, notably the Huns and the Slavs. In 895, a group of tribes unified, and for the first time Hungary was an independent and sovereign state. At first, Hungary waged war and attempted to expand its territories outwards into Western Europe, but ultimately these efforts subsided and Hungary attempted to integrate itself. This process involved the adoption of Christian practices. Hungary’s influence over the European political scene peaked in the 1300s and 1400s, when they crushed invading Mongolian raids and became one of the leaders in the European Renaissance movement. However, a series of poor decisions made by King Vladislaus II in the late 1400s drastically reduced Hungary’s prominence, as well as paving the way for the impending Ottoman invasion. After more than 150 years of fighting and invasions, the Ottomans ultimately won control over much of Hungary, which effectively divided the country into three kingdoms. By 1717, the Ottoman Turks had virtually lost all control over Hungary, but by this time the country’s ethnic, cultural and religious landscape had been completely changed. The 1800s saw Hungary beginning the process of rebuilding and reforming its government. One of the most critical events of this period was the signing of the Austro-Hungarian Compromise by the Hapsburgs, which in 1867 unified Austria and Hungary. This dual monarchy did a lot of good work in improving the Hungarian economy and infrastructure. Unfortunately, the assassination of Franz Ferdinand in Austria-Hungary sparked WWI, which entered on the side of the Central Powers. Their ultimate loss in WWI split Austria and Hungary back into two countries, as well as opened the doors for the Communist party to take power. In 1920, Hungary was dealt a heavy blow with the signing of the Treaty of Trianon. The treaty’s strict clauses saw Hungary lose more than 70% of its land and roughly two-thirds of its population. Hungary was again ravaged by war with the outbreak of WWII, which it entered on the side of the Axis powers. The country was completely decimated during the war, and following their surrender, the Hungarian economy tanked. Though it was not a popular decision, Hungary became a part of the Soviet Union during the Cold War thanks to the Warsaw Pact. As a member of the Soviet Union, Hungary managed to stabilize. Since the USSR has dissolved, Hungary has become a capitalistic and democratic country. Though it has suffered some setbacks, by and large Hungary has done an admirable job in stabilizing its political and economic situation and raising the quality of life of its citizens. No trip to Hungary would be complete without spending some time in the capital city, Budapest. This vibrant city epitomizes what a great European city should be: impressively classic, yet also strikingly modern. Most of Budapest’s most famous landmarks, such as the Royal Palace or Matthias Church, can be found in an area called Castle Hill. This area also includes many of Budapest’s best known museums. Meanwhile, the downtown area of Pest features most of the government and administrative buildings. Here, travelers can see the impressive Parliament Building, as well as the equally impressive St. Stephen’s Basilica. Budapest is also known for its music scene, and tourists are highly encouraged to catch local performers at one of the many clubs and music venues scattered around town. Though Hungary features a number of gorgeous lakes and streams, Lake Hévíz is something of an oddity. It is considered Europe’s largest thermal lake, meaning the water is heated by geothermic activity much like a hot spring. What’s more, the water in Lake Hévíz moves in an incredibly powerful manner, and many believe that the entire lake’s water is replenished each and every day. Naturally, the thing to do at Lake Hévíz is relax at one of the spas. The water is said to have therapeutic properties both from its temperature and chemical composition. However, the fact that the lake itself and the surrounding countryside are absolutely pristine definitely adds to the calming nature of this unique destination. 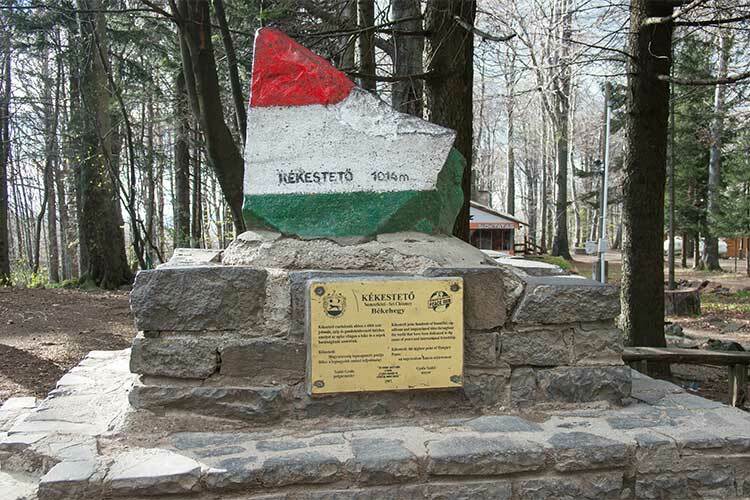 Kékes is Hungary’s tallest mountain, as well as a major ecotourist destination. The mountain is well known for its hiking trails and other outdoors activities, and has also risen in prominence in recent years as a ski destination. At the top of the mountain sits a few smaller stores and restaurants, as well as an interesting TV tower that was used until 1981. For a fee, guests can take an elevator to the top of the tower, which is considered the highest point in all of Hungary. 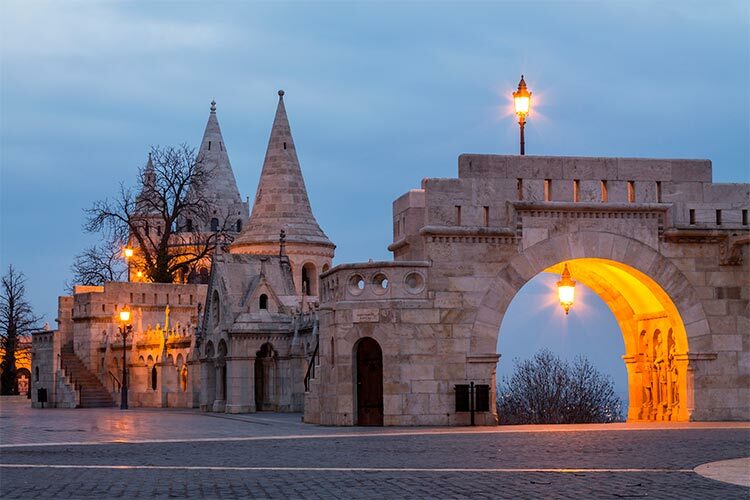 As one might expect, the top of the tower offers unparalleled views of Kékes and the Mátra mountain range. 1) Although Pécs has developed something of a reputation as a college town, it is still one of the more lovely small cities to visit in Hungary. The city is famed for its Roman era ruins, which include Europe’s largest early Christian necropolis. Pécs has also become increasingly popular for its fine dining scene. 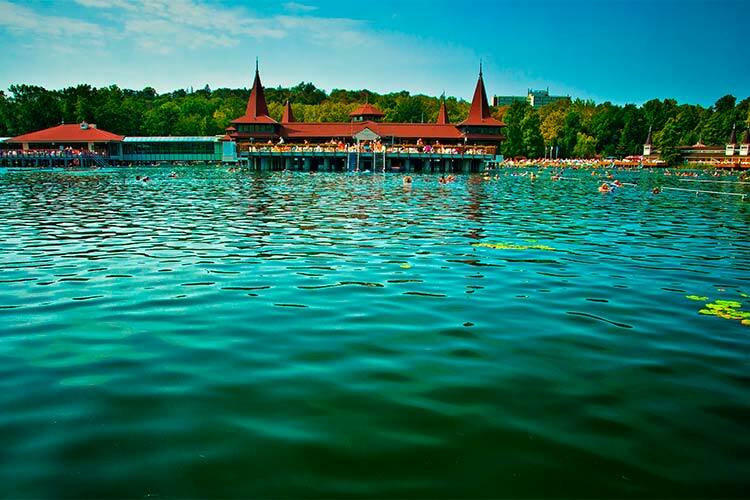 2) Spend some time soaking in the warm waters of Lake Hévíz, gazing at the the gorgeous surroundings. 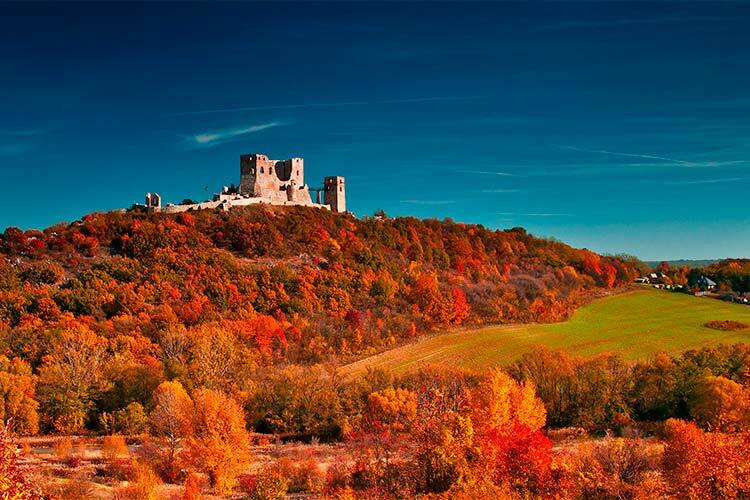 Furthermore, be sure to spend some time in the charming nearby village of Hévíz. There also a number of delicious eateries surrounding the banks of the lake. 3) There’s tons to do for the discerning traveler in Budapest. Some of the city’s top sites are scattered around Castle Hill, with the highlights being Matthias Church and the stunning Royal Palace. Tourists should also make a point of seeing Budapest’s many attractive bridges, notably the iconic Chain Bridge. 4) If you’re in good shape, there’s nothing quite like a hike to the top of Kékes. Besides being reward with a great view from Hungary’s tallest mountain, you can also explore the abandoned television tower on the summit. There’s also a few shops and restaurants residing on the mountain’s peak. 5) Miskolc’s downtown area, especially near Széchenyi Street (Main Street), is a bustling centre of activities for tourists. Besides offering the chance to visit several ancient churches, this area also features the lovely Avas Observation Tower. Visitors are also highly encouraged to visit the Cave Bath, an atmospheric hot spring spa located inside a series of large caverns. 6) No traveler should visit Debrecen without making a point of stopping at Nagytemplon, the Great Church (pictured below). 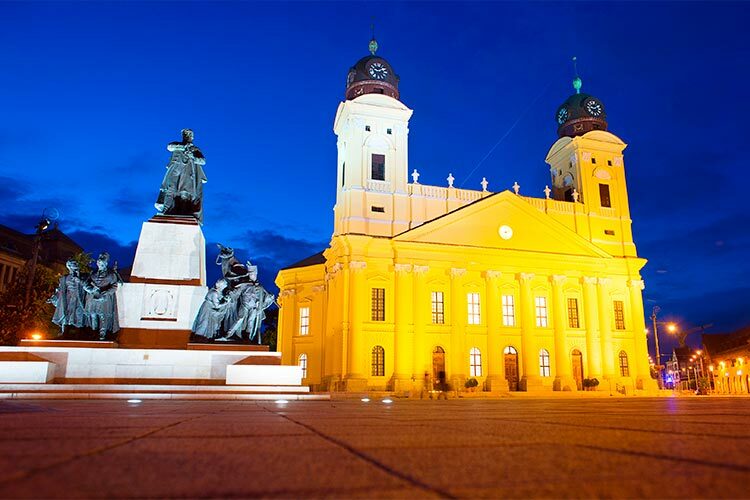 Adjacent to this iconic structure is one of Debrecen’s best museums, the Déri Museum. Visitors should also make a point of visiting Nagyerdő, an enormous city park with an attractive series of lakes and fountains. 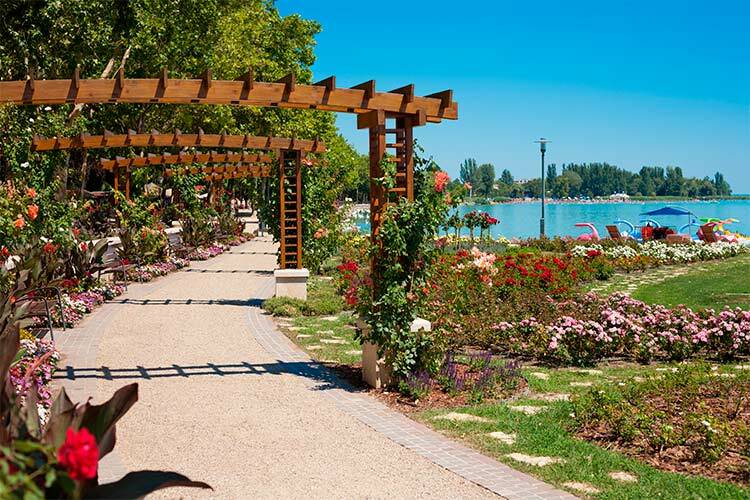 7) Seeing as Szeged is widely lauded as having the best climate of any Hungarian city, it’s hardly surprising that the city’s top attractions including catching a performance at an open-air theatre or strolling through parks. Szeged also features a number of spas and thermal springs, of which Anna Fürdő is likely the most popular choice.